Well well! My biggest takeaway from WordCamp Europe 2017 is the lesson that unplanned activities are the best! I wasn’t actually planning to attend WordCamp Europe 2017. I am currently trying to expand my business and I had already made a lot of expenses. I really didn’t think I’d be able to finance myself for the trip. Just then, I received travel and stay assistance. I am very thankful to Mayuko Moriyama for giving me that opportunity. I hope someday in the future I will also be able to give back travel assistance to someone else for a WordCamp. So now that WordCamp Europe 2017 is officially wrapped up, I want to share my experiences with you all. The flights were pleasant, honestly. Upon reaching Paris, for the first time in my life, I took the public transit to get to the hotel. Usually, I either take a taxi or use Uber. All thanks to Mayuko for being such a great organizer, she even sent me photos of the stations and routes from the Airport to the hotel. That gave me confidence that I wouldn’t get lost, so I gave it a shot. I also got myself a 7-day commute pass so it’d be easier for me to get to places during my stay. I stayed at St. Christopher’s Hostel with Mayuko, Nok, Thabo, and Roberto. Everyone was so friendly and we became fast friends. The next day the action began – The Community Summit. It was held at Novotel Hotel, very near to the Eiffel Tower. It was a beautiful hotel with an amazing view. I met a lot of familiar faces and also got to know lots of new people. I met Rocio Valdivia and Andrea Middleton from the Community Team. It was really great to meet and talk to them. I also got to meet up with Ulrich Pogson and Carolina Nymark from the Theme Review team. It was my first time meeting Carolina, even though we’ve been chatting on Slack. That’s one thing I love about WordCamps, it lets you meet face-to-face with people who you’ve worked with only online. There were people from all aspects of WordPress: Core, Plugin, Themes, Accessibility, Design, Polyglots, Documentation, TV, Support, Meta and everything else. There were different types of cheeses and sweets laid out for snacks that we had access to all day long. And… that is all I am free to share with you about Community Summit. So, if you want to know more, please visit https://make.wordpress.org/community/. The Community Summit notes will be uploaded there by 2nd July at the latest. The third day of my stay in Paris, on Thursday, June 15th, 2017, was the Contributor Day. It took place in Les Docks de Paris. The Opening Remarks was great as always. We went on to join the different teams for contribution. I joined the Theme team, Plugin team and Community Team happily contributing in all three of them. I was mainly involved in Theme team, where I reviewed themes and pushed them live. I also helped a few people learn about Theme Review. The day was fun and interactive and also a great opportunity for networking. I also talked to them about the upcoming Contributor Day in WordCamp Kathmandu 2018 and asked their opinions on when we should have it. Since it will be our first time, everyone suggested that it’d be better to hold it after the WordCamp. We’ll surely be taking that into consideration when deciding the dates. We later had a volunteer orientation session so all the tasks were specified to us and the timelines were given to us. The evening that day, I went for a small Japanese dinner with Ulrich, Mayuko, and Marius. We had fun teaching Marius how to use chopsticks. He caught up within just a few tries. The dinner was nice and we had a good time talking and sharing ideas. The trip was filled with so many new experiences, and one of them was having dinner when it was still light outside. As Paris experiences daylight till around 10-10:30 pm, it was allowed me to do so much like sightseeing even though my watch said it was technically night-time. Later that night was the Speakers’ and Sponsors’ Dinner held at Le Concorde Atlantique – a beautiful bateau. We had an amazing view of the sunset from the boat. I also met so many different team members there and got to hear what they’ve been up to lately. Listening to all the progress they’re making, it made me realize that I was falling behind a little. Honestly, I had been at a point where I was unsure of what to do next and talking to all of them has given me an increased dose of energy. The party went on till late and there was even an after-after party that I decided to skip as I was starting to get sleepy. I needed to be as fresh as possible for WordCamp Europe 2017. I probably don’t need to elaborate on the WordCamp, everything went superfine and the event was amazing. I was volunteering again but on the first day, I was only posted from 4-6pm at the Happiness Bar. So I had fun collecting swags like t-shirts, bags, caps, power bank and cool stuff like that. Later at the Happiness Bar, I solved a few queries, but there weren’t too many so I wasn’t spent working there. Later that evening, there were lots of parties going on organized by different teams. I went to Themers Meetup first, where WordPress theme developers and theme shop owners came together. We had a nice chit-chat for a while. Later I went to dinner with the ProsPress team. We had a fine French dining experience. All the while, we had fun translating all the names on the menu into English with our server who was very expressive and funny. I was later supposed to go to the WP Engine party but unfortunately, due to my energy levels that were receding, I couldn’t join them. Also, I was volunteering the next day from 8 am. So sorry guys, responsibility comes first. I will make sure to join you the next time. A top priority, I promise! On the second day of WordCamp Europe 2017, I was volunteering for Floor Orientation in Track 1. I felt so lucky to be volunteering for orientation. It hardly felt like for and even though it was a good 5 hours, the time flew by. It was more like meeting new people, chatting up with them for a moment, and I was never bored. So if you guys are volunteering at a WordCamp next time, I hope you get a chance to help in Floor Orientation. That’s probably the best job out there. I talked to the sponsor teams like Jetpack, WooCommerce, Mojo Marketplace, WPML, Bluehost, Siteground, Sitelock, about how things are moving forward. Now the new thing coming up, Gutenberg. I’m really excited to see Gutenberg going live. It’s probably coming live in WordPress 4.9 or 5.0. Though I think WordPress 5.0 would be a better time to release. But we also have to keep up with the times and so much more thought and actions have to be put into this. Let’s talk about the best happenings in a WordCamp – the Afterparty. The afterparty is an amazing time to talk, dance, and exchange ideas that help build something extraordinary. Oh boy, what a party it was. It took place at Le Pavillon d’Armenonville. The place was big and we were welcomed with an amusement-park-like train. The party was 1960s themed, and I didn’t know of it. So I was casually dressed but there were a few who came dressed the part. There was a great photo booth for us to click pictures. There were so many people attending there was a long queue for food and drinks. I feel the after party was a grand success and I got to socialize with so many like-minded people who left me reenergized and refreshed. It was a relaxing and rejuvenating end to the WordCamp. WordCamp Europe 2017 was the best WordCamps I’ve been to. I am very energized and plan to go much further. I have lots of new plans and visions in my mind to move forward. I have more products in my mind. I plan to be more detail-oriented in my work now onwards. So I’m expanding my business and yes, Catch Themes is hiring. So if you or anyone you know wants to, can apply as I look forward to growing the team. WordCamps are lesser a platform to learn and more a way to bring in fresh ideas and energy. Going to WordCamps help you get out of the stagnation you might be in. I highly recommend everyone to join WordCamps, be it local or foreign. Looking forward to a better year… Cheers! P.S. There’s more exciting news I want to share with you all. Stay tuned! 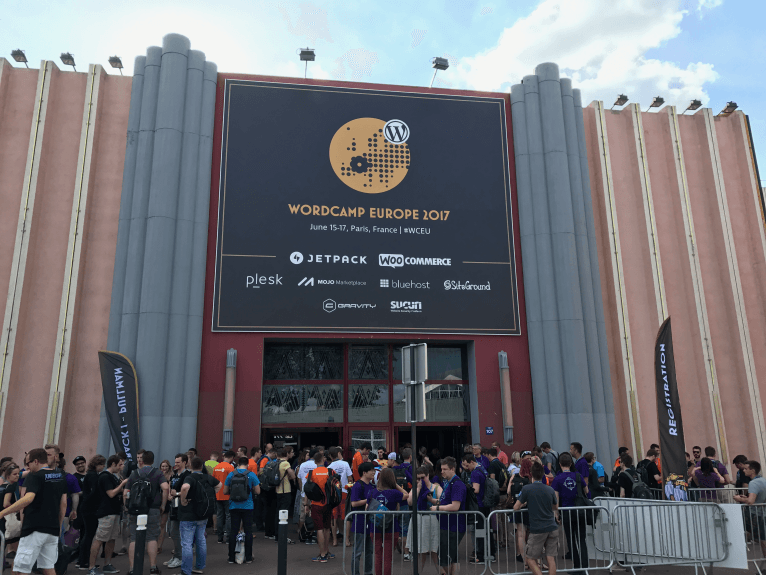 Here are some snaps from WCEU 2017. This entry was posted in Events, Travel, WordCamps and tagged Paris, travel, WordCamp Europe, WordCamps by sakinshrestha. Bookmark the permalink. ← Previous Previous post: I HAVE VERY EXCITING NEWS TO SHARE! !